LOL... you do realise that his name is pronounced 'shock' there lies the confusion. Well, not so much confusion as "too lazy to check sources." well, all in all, we can agree that at some point the head was remodelled and current head carving is not the original. Well, some of us (read: you) are wrong. But you're already on the list of the excommunicate depraved for felinophilia, so why not enjoy the rest of your time on Earth before The Return with interesting heresies! i believe sesh is wrong, too. but, he is consistent with the Khafre/Khufu Giza plateau builders narrative. Actually, I thought the sphinx was covered with a bad cement job. I'm sure the Sphinx looked very different whenever it was made. It was probably painted too. BTW, I'm still wondering about that underground room. It's just, why was it there. With the dead end tunnel and the pit or well. I suppose we will never know unless documentation of some kind is found. Thanks for answering me. Did you read through the link? Gives a rundown if the basic theories and how they relate to what we know of Egyptian culture. Not really. The upper parts were and are still exposed bedrock. It was the lower parts that were clad. My understanding was that that cladding wasn't original, but from repair work through the ages? ShadowSot, Yes, I read the link, but it was unsatisfying. It didn't really enlighten me. 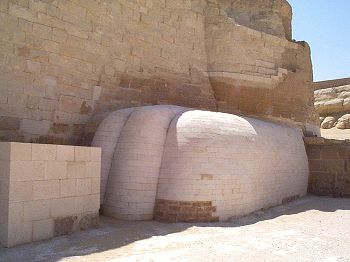 Harte, The bottom of the sphinx, the feet, lets, and especially the sides and rear legs look look like a thick coating of cement over brickwork. I know they covered over an opening in one of the sides, the hole in the head. I really wish people would stop doing cosmetic work to antiques. Looks awful. I'd really like to see the original work. Don't think there was a lot of sand in the plateau at the time. 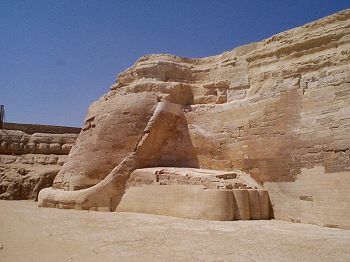 Though the Sphinx was covered up to its neck later on and was restored by Thutmos IV. It'd be interesting, but I don't know anything about how they may have done it besides having a large team of workers. It also depends on how the sand was deposited. What was the plateau like when they were built? I just took it for granted that it was desert. I should know better. I just thought it was because of that theory that they used water on the sand to slide the giant blocks to the building site. I don't think that would have worked. I liked the canal theory better. "All truth that comes not from the Hounds is no truth." Lots of the original work was eroding away a few hundred years after the thing was carved. The AE's themselves repaired it with stones. Modern repairs mostly focused on damage created in modern times. The hole in the head you mention was greatly enlarged by treasure hunters, for example, and the hole in the side was entirely created by the same profiteers. Below are examples of the restoration carried out by the (modern) Egyptian government. Here's a fairly close-up pic of restoration done to the other side. It is clear that carved stones were used (exactly as was done in ancient times) and no cement is covering anything. I don't know about using water on the sand. I doubt it. But the stones that were brought via canals came from the Nile - upstream are the granite quarry (at Aswan) used and the limestone quarry (at Tura) for the fine white limestone used to cover the exterior. The rest of the stone came from quarries right there in front and to the side of the pyramid. Remains of ramps leading out of one of the quarries have been found leading to the pyramid. @Harte do you think that the head on the sphinx is the original or has it been re-worked? No. Are you confused about Harte's photos? Stories don’t mean much without verifiable evidence to support them, and the evidence doesn’t. You mean they don't prove much. But what the generations before us believed is always a good place to start when uncovering history. Not all stories were told for no reason... much more often to explain or remember something you know. In the context of "evidence" I meant what I said, they don't mean much. And trying to determine what these stories may or may not have meant or attempted to explain is grossly subjective to begin with and therefore open to a wide latitude of interpretation, thus not necessarily correct. Example: The beliefs of more modern Egyptians concerning the ancient history of their country, reinterpreted by numerous immigrating foreign peoples over the last 2000+ years, quite often bears little resemblance to actual AE history. Actual evidence shows the 7000 BP date is grossly incorrect, so why claim it's relevant? I think it's the original, because I go with the evidence we have and we have no evidence of anything else. The claim that it doesn't look like Khufu doesn't hold water with me, since the only likeness of Khufu we have is a tiny ivory statue of him. As an historian, I can tell you this is not at all true. If no other example, consider all the nationalistic morons who come here, trying to promote the idea that all civilizations "really" began in Serbia or India or Russia or wherever they happen to live. People forget real local history all the time and there are always profit-driven stories made to replace it. How would the locals know? Why would you assume they had any valid notions on the matter? The "generations before us" believed quite a few things that are not only untrue, but even border on the idiotic. Not to mention that they have the imperative to insert Mohammed into the story in some way or the other or it's the death penalty. What used to pass for "science" averred that flies spontaneously generate from rotting meat. For surgery, you used to go to your barber. As recently as a century or two ago, it was well-known in scientific circles that stones do NOT fall from the sky. That really can't be a reliable or useful way to approach historical study. It's hard to imagine how many dozens upon dozens of generations passed between the carving of the Sphinx and the lives of the modern population of Cairo (a city that didn't even exist wheb the Sphinx was taking form). The people were different. The ethnicity was different. The language was different. The religion was different. The form of government was different. The very culture was different. As an example, it would be about like asking a modern Northwest Coast Amerindian to explain the history and culture of Southern Plains Indians from thousand of years ago, using only oral history. The Northwest Coast fellow might be a good story teller, but whatever he comes up with is apt to be totally incorrect. There's also how the same people in the area much later made up entirely new stories about the pyramids and the Sphinx mixing together Egyptian, Greek, and Abrahamic traditions. Which probably weren't meant as history but taken literally by later writers.